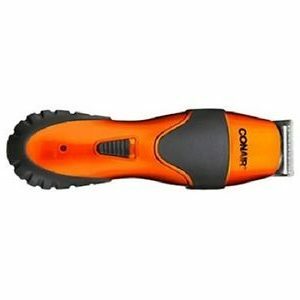 If you are someone who prefers a corded beard trimmer more than a wireless one, then the Conair Chopper is going to be perfect for you. It comes with a lot of accessories such as 5 position comb attachments, three jawline combs, a styling comb, a mustache comb, barber scissors, barber cape etc. Many users liked the product while some did not. If you are going to trim your beard too short, this product is not recommendable. If you are someone who loves products from Conair, then you will love this because it is an upgrade to previous versions. The design has altered slightly. The buttons have a new look now. The screw hole on the back was not there earlier. They do look similar though from a far distance. The older version was light orange whereas this has a metallic texture. The bottom part of the two heads altered their design, so if your old ones from Conair do not think they will work this one. A difficulty you can face that was absent in the old version is that it is easy to pull the heads off, but fairly tough to put them back. You will have to struggle every time. While you are using, it you will get enough power to trim beards but if you are in a rush or have stubborn hair you can use the turbo button. Many users complain the turbo button is not able to provide enough power. Some people say that they cannot continue with their grooming session properly because of its malfunctions. The reason people choose corded over cordless is because of power. There are a lot of drawbacks such as you will also need a power supply to operate it, does not come with a battery so it is not possible to charge it and it is not convenient. You cannot use it anytime or anywhere. The other reason is that there is no need to worry about the charging during use. The cord is very long: 6 feet. It comes with a cleaning brush and oil. You can take care of the blades with the oil. They are made of stainless steel so you do not have to worry about them rusting or damaging. There is a pouch where you can store it after use. If you have bad experience with the old Conair beard trimmers or clippers where the plastic broke, this should make a difference. It will not break easily and even if any part breaks, contact the manufacturer for a replacement. Unlike other beard trimmers, it comes with a warranty of five years. If you can take care of it, you do not have to buy trimmers over and over again. The price tag of this is reasonable as well. You can make your grooming inexpensive but make yourself look stylish.